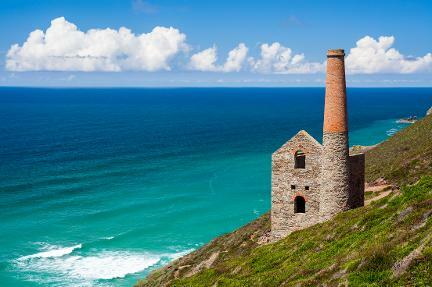 Jurassic Coast and Cornish Tin Mines - We visit the Cornish Mining World Heritage Site and do an underground tour in the Geevor tin mine. Archeopteryx Adventure with Volcanoes and Geoparks - We visit the Aalen Iron Mine. Trilobite Safari - We visit a salt mine in the High Atlas and a mineral specimen mine near Taouz. Gold, Diamonds and Mammal-like Reptiles - We can descend 220 m underground at the Gold Reef Mining Museum, we also visit the Cullinan Diamond mine, the source of the world's biggest diamond. Castles and Dragons - We can descend the Big Pit coal mine, part of the National Mining Museum and Blaenavon World Heritage Site. Day Trips - The Historic Beacons sightseeing tour visits the Big Pit coal mine. Getting ready to descend the Big Pit mine in the National Mining Museum of Wales, Blaenavon World Heritage Site.